5 11/8/2013 Monroe 2 BOCES Dettman, Giuliano, O'Meara, Witter 5 What do I use? 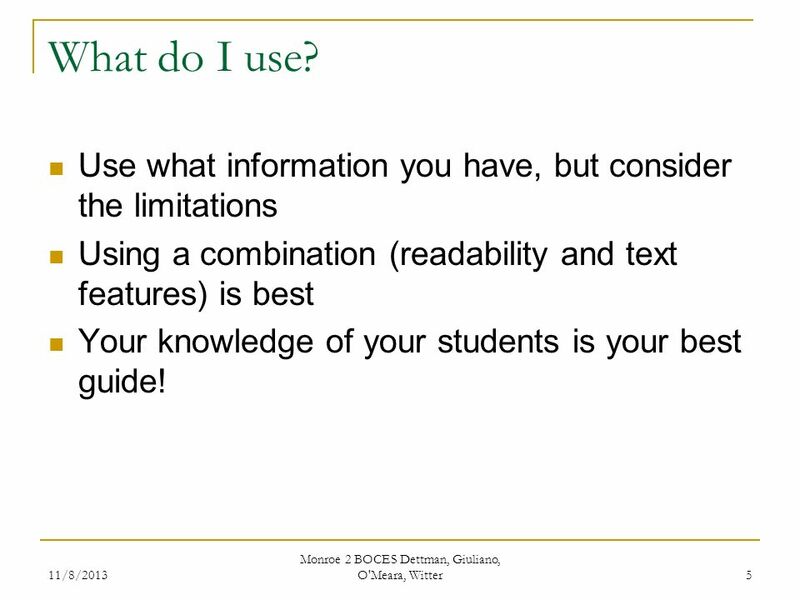 Use what information you have, but consider the limitations Using a combination (readability and text features) is best Your knowledge of your students is your best guide! 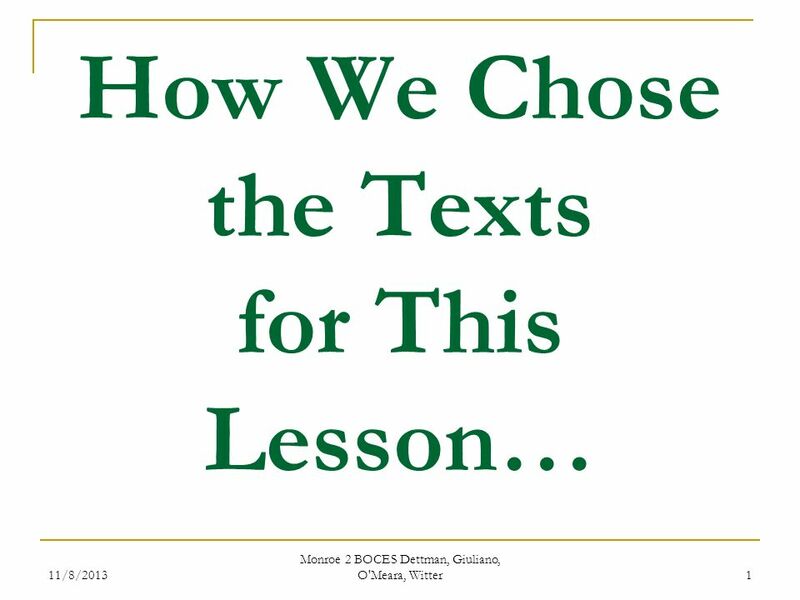 Download ppt "11/8/2013 Monroe 2 BOCES Dettman, Giuliano, O'Meara, Witter 1 How We Chose the Texts for This Lesson…"
The Basics of Plain Language © 2005 William H. DuBay. Margo Edgar Kate Story. Workshop Overview Background Educative Purpose of project Explicit teaching of critical and creative literacy through digital. Why? You will read a wide range of texts in many academic disciplines as preparation for college and the workplace. Module 1: Common Core Instruction for ELA & Literacy Informational Text Audience: K-5 Teachers Area V Regional Superintendents of Schools Robert Daiber. Copyright ©2011 Commonwealth of Pennsylvania 3. 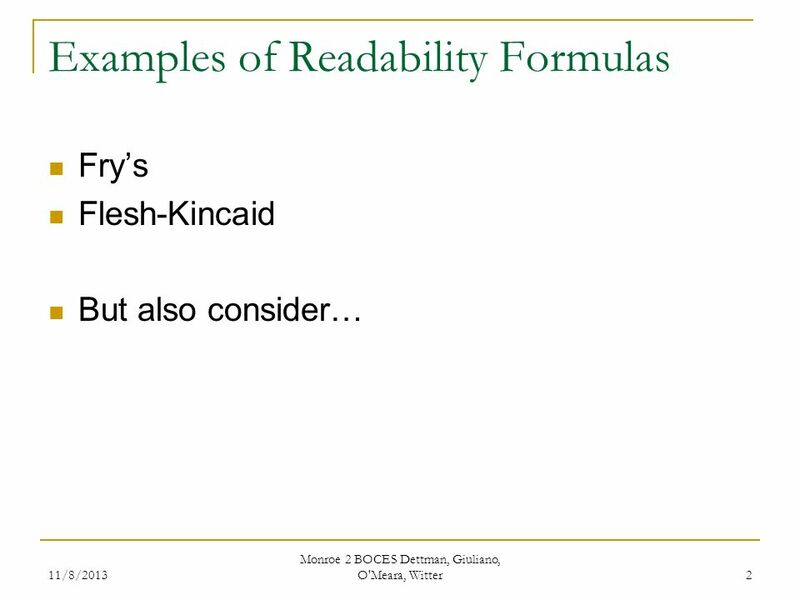 The Maryland Common Core Frameworks for Braille: Identifying the Next Generation Grade Level Braille Literacy Needs of Students Lisa Wright & Heather Johnson. 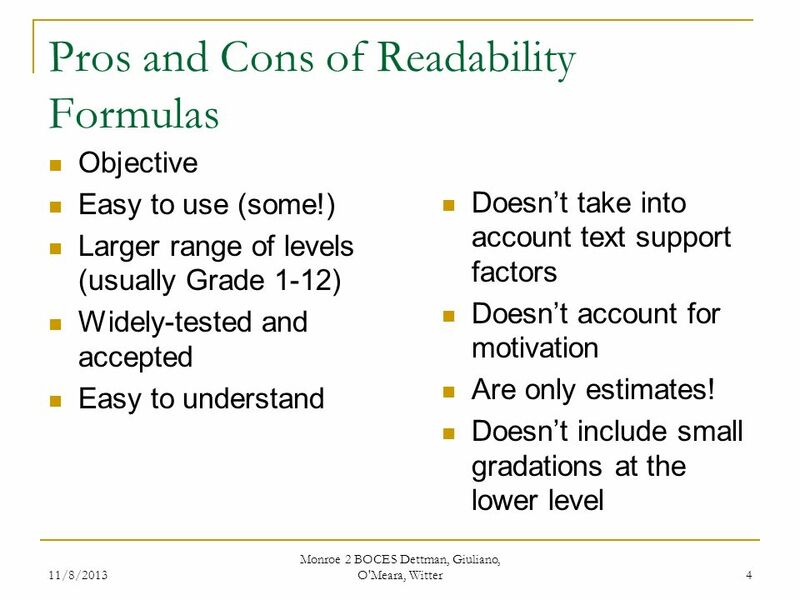 Balanced Literacy How our instructional practices will support the implementation of Common Core. A / A* Communicate a lot of relevant information in well sequenced paragraphs Narrate events, give full descriptions Express and explain ideas and points. The Common Core: Shifts and Strategies October 7, 2011. Independent eBook Reading with Vocabulary and Comprehension Assessment for today’s students Allows students to work individually. Lakshmi Valdes Tina Hanby. The Fountas & Pinnell Leveled Literacy Intervention System (LLI) is a small-group, supplementary literacy intervention designed. WRITING GENRES & THE CCGPS. What is a genre? A category of composition characterized by similarities in form, style, or subject matter. 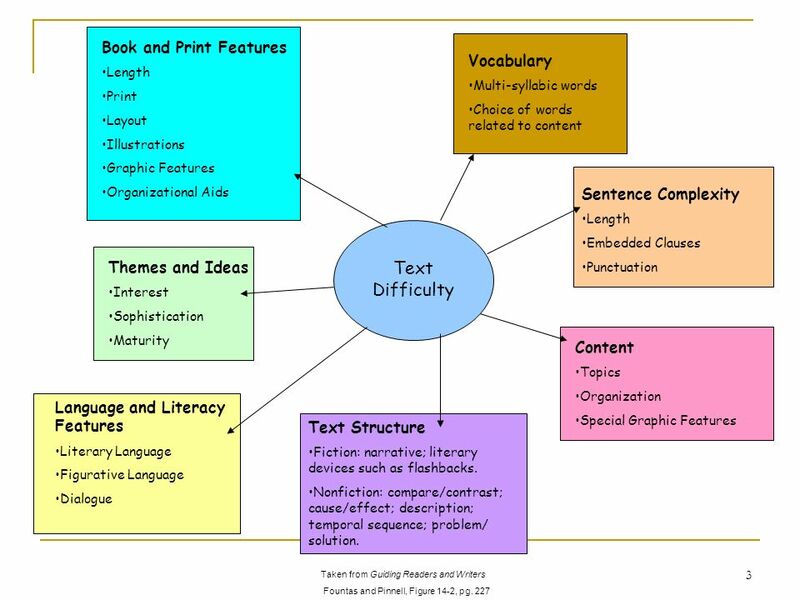 Focus Education Assessing Reading: Exceeding Year 6 Expectations Year 6 Exceeding Expectations: Comprehension Explain the structural devices used. Searching For and Using Information: Skip Intro Skip Intro Students in all academic arenas are required to find answers to various problems, big and small. Are guides  Students will read beyond their level when they’re motivated by a topic.  All students can be encouraged to read nonfiction books which. 124. Cont. 5 Re-read RW1.5 Understand and explain the figurative and metaphorical use of words in context.